Yolanda Gonzalez, a sixth-grade teacher of Pomona, Calif., demonstrates as part of the March for Science in downtown Los Angeles on Saturday. Members of the Union for Concerned Scientists pose for photos with Muppet character Beaker in front of The White House before heading to the National Mall for the March for Science. Abralyn Weidow (left), Geyo and Stirling explore "Magic Nuudles" at the Kids Zone during the March for Science event in Washington, D.C. 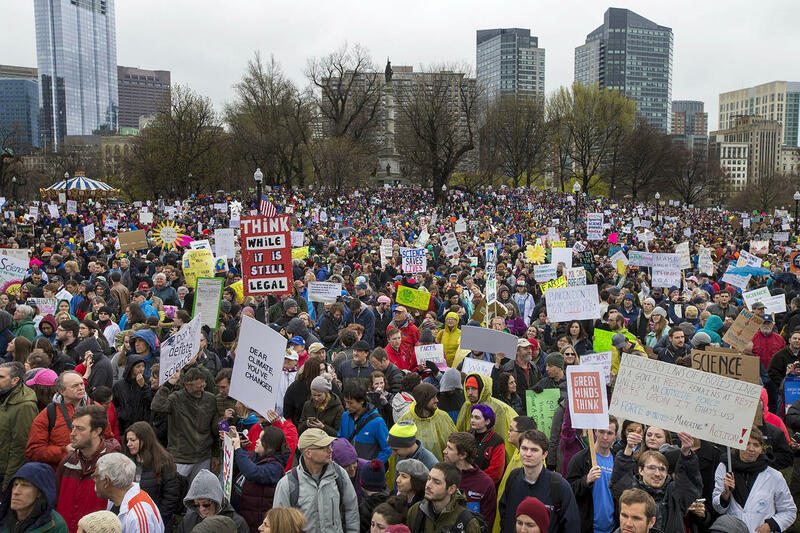 The main event is happening in Washington, D.C., but satellite marches are planned in all 50 states, and at least 610 marches have been registered on the March for Science website across the world. Demonstrators participate in the March for Science in Berlin. 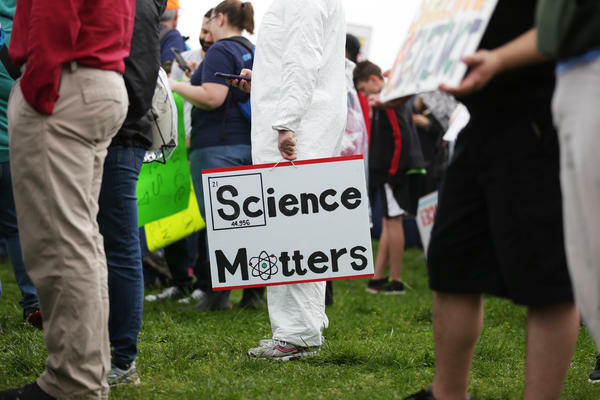 The March for Science organizers have said their own events are nonpartisan, and the overarching mission is to "[champion] robustly funded and publicly communicated science as a pillar of human freedom and prosperity." People take part in the March for Science in Paris. The sign reads: "A human change, not a climate change"
Supporters of science and research gather for the March for Science protest in Sydney. 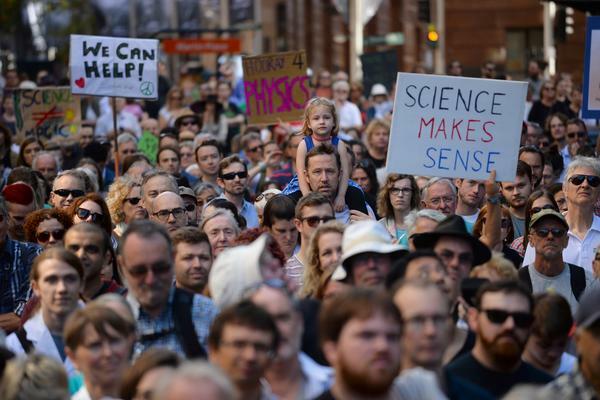 Thousands of people rallied in Australia and New Zealand. 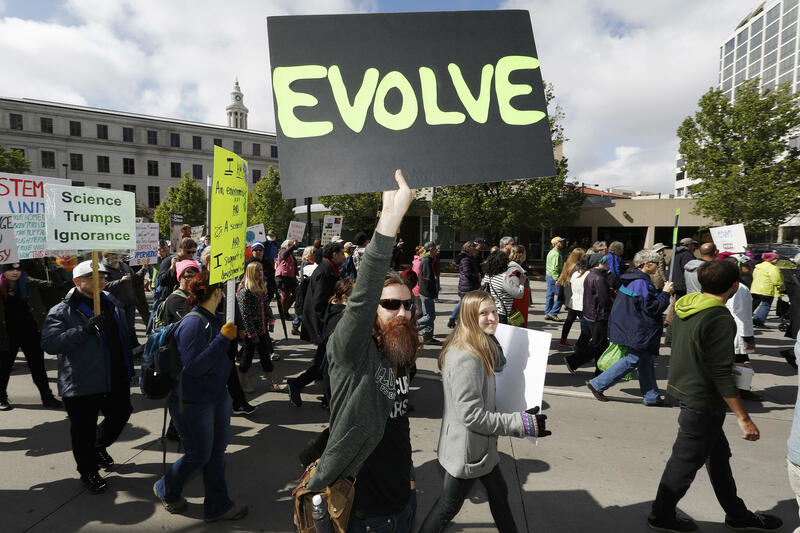 Protesters wave signs during the March for Science in Denver, Colo. The organizers don't expect the event to end on Saturday. They've planned a week of action for April 23 through 29. 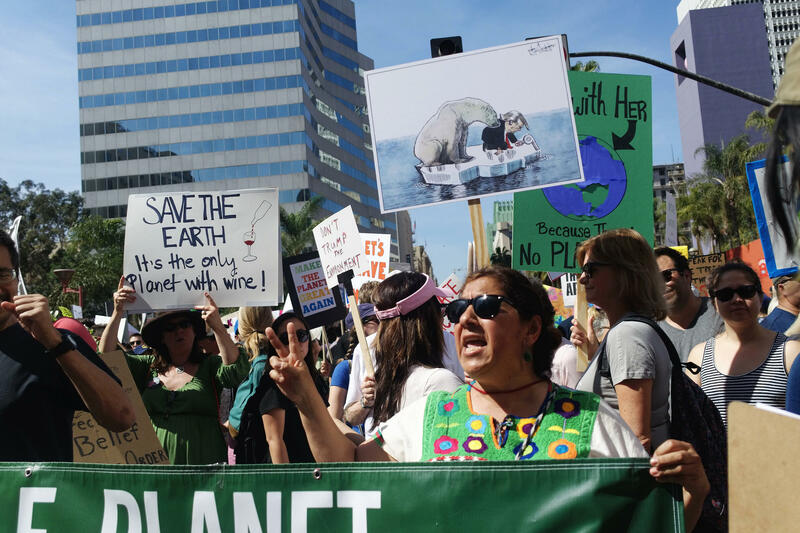 Yolanda Gonzalez, a sixth-grade teacher of Pomona, Calif., demonstrates as part of the March for Science in downtown Los Angeles. Thousands of demonstrators turned out for the March for Science in Boston. Crowds gather at Justin Herman Plaza near Pier 39 for the March for Science demonstration in San Francisco. 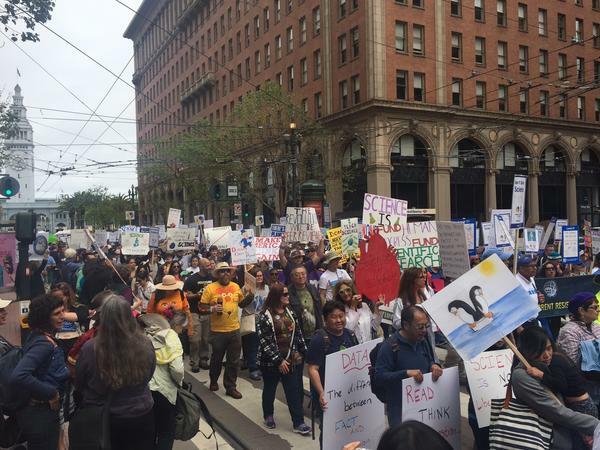 Marchers on Market Street in San Francisco make their way from Justin Herman Plaza to Civic Center plaza. 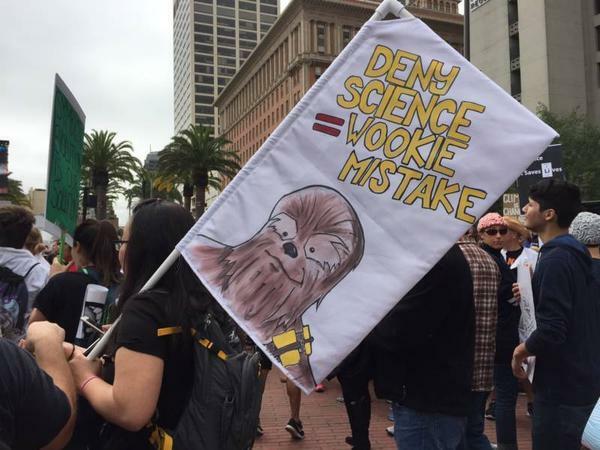 A woman holds a sign that says "Deny Science=Wookie Mistake." 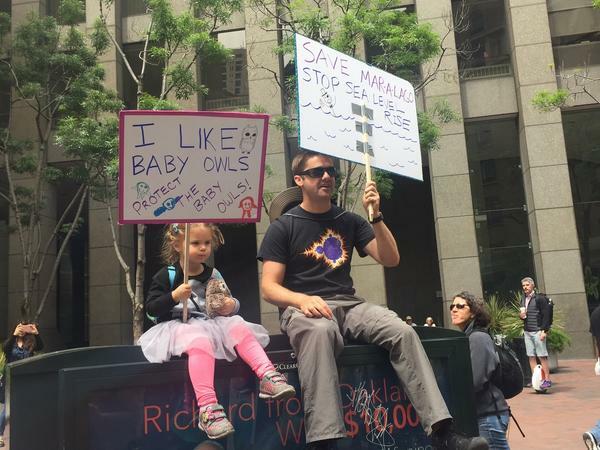 Mountain View resident James Balkite with his daughter Parker. 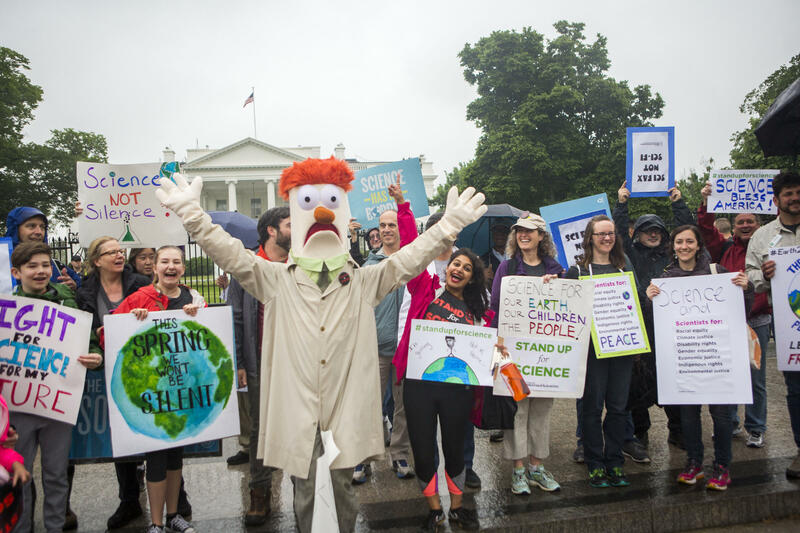 "I'm hopeful that the current administration will take Science more seriously, more seriously than it has so far," he said. Demonstrators gather before the March for Science on the National Mall in Washington, D.C., on Saturday. 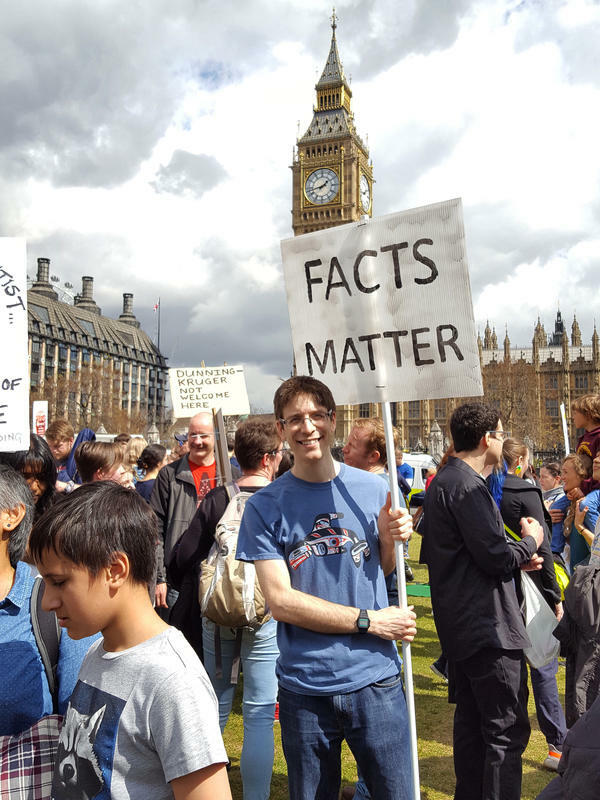 The March for Science in London ended at Parliament Square where thousands of marchers heard talks from scientists and journalists. While they may not have registered with the main march, a group from the Neumayer Station III in Antarctica gathered on Saturday to support the international efforts. The idea for the demonstration started after the large Women's March on Washington that took place in January, one day after President Trump's inauguration. The Women's March was, in large part, a response to Trump's agenda and spurred by statements he made about women. The March for Science organizers have said their own events are nonpartisan, and the overarching mission is to "[champion] robustly funded and publicly communicated science as a pillar of human freedom and prosperity." 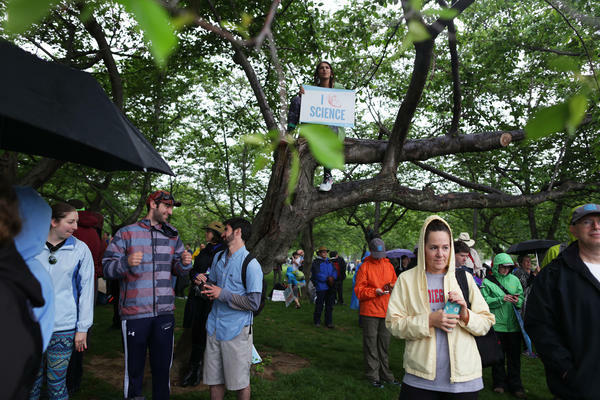 "I think the profession of science is under attack, and why is that happening? 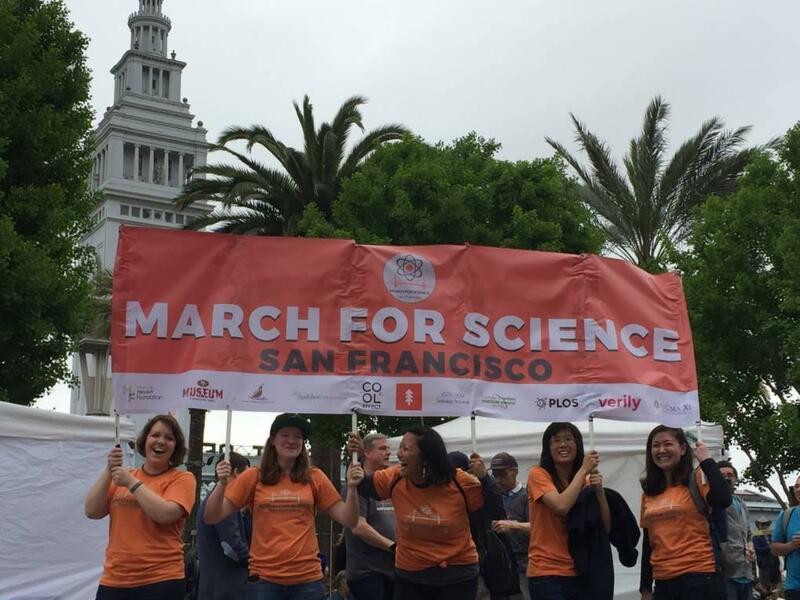 Because we've really ceded the floor," says Lucky Tran, a scientist and organizer of the march. "We haven't engaged in politics, we've left that open for politicians to come in and really hijack and obfuscate science for their own selfish needs." 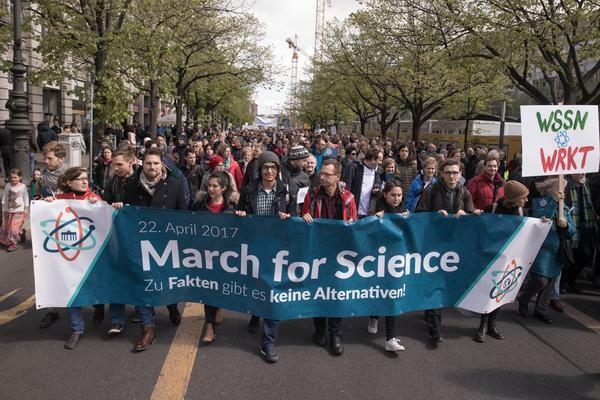 "Some researchers predict that this March for Science will release much needed energy and enthusiasm at a time when science is under threat; others worry it will damage science's reputation as an unbiased seeker of truth." Even though the future of science under the Trump administration has been a concern for many, Tran, in at interview with host Mary Louise Kelly on Weekend Edition, says science has been under attack since long before Trump took office. 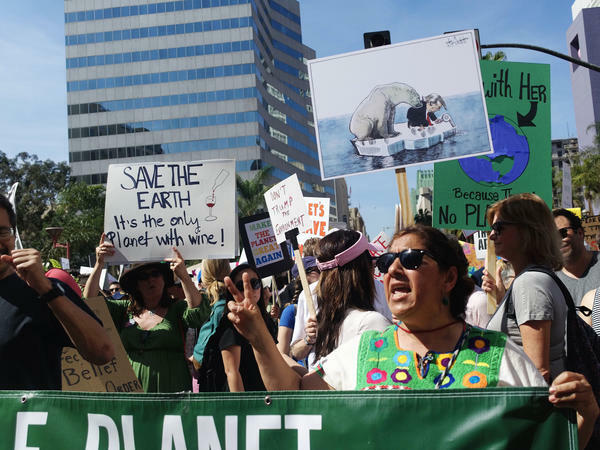 "Really, what's happened is scientists are scared to engage with politics," Tran says. "They're worried about looking biased, they're worried about their funding, but really that's been a terrible strategy. It's meant that bad science policy decisions have been made. 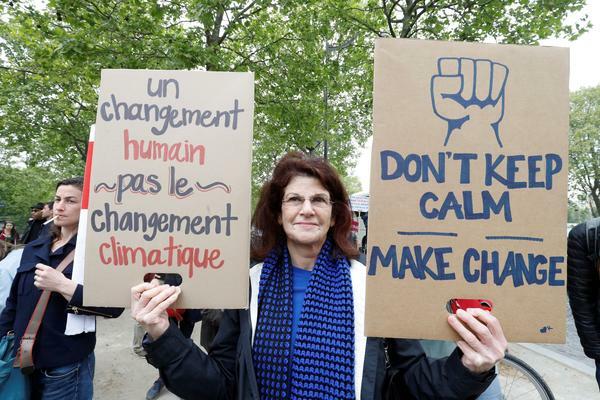 "If you look at climate change or public health, they're under attack from certain groups because they involve regulation or some businesses have an interest in them or there's some political interest to be gained from them," he says. In Washington, along with the demonstrations, those participating can go to "teach-ins." 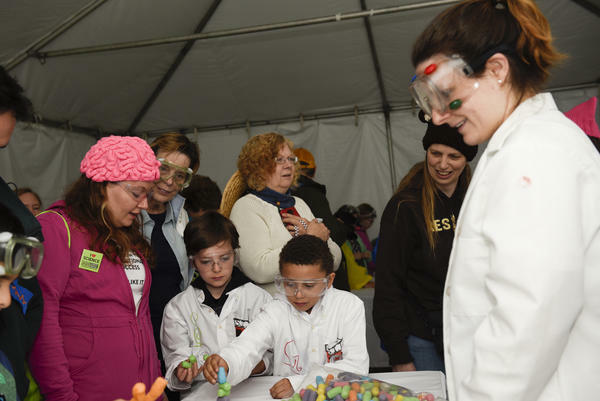 These events are meant to engage the public on science topics like "sustainable food solutions" and "the physics of superheroes." The organizers don't expect the event to end on Saturday. They've planned a week of action for April 23 through 29, and Tran said the group will roll out a policy platform after the march. The man at the heart of the legal resistance to the Trump agenda works in an unfinished office a block away from the White House. 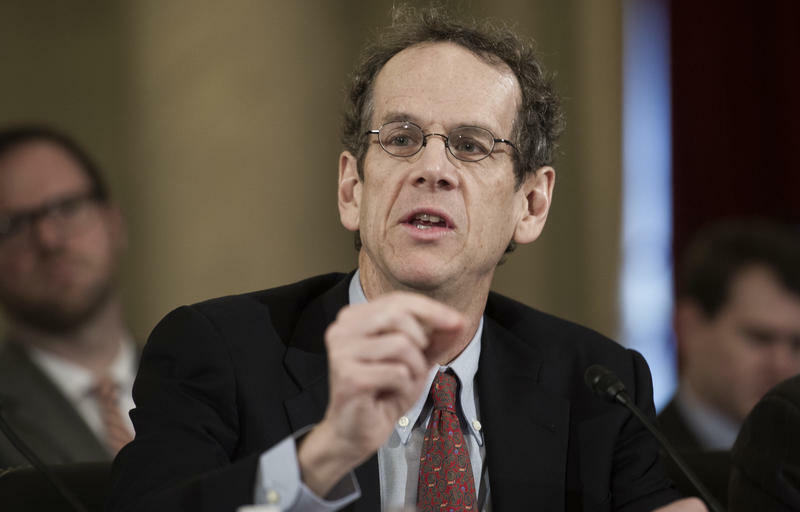 David Cole, the new national legal director at the American Civil Liberties Union, hasn't had time to hang pictures on the wall or remember to bring a mug to hold his morning tea. "I get to wake up every morning and I get paid to think about how to respond in ways that will preserve our basic rights and liberties," Cole said. "That's a tremendous privilege."